The mysterious Samsung SCH-I425, also known by its "Godiva" codename, appeared on the GLBenchmark database earlier this week. And judging by its model number, we were quick to assume that it was a successor to the Samsung Stratosphere II (model SCH-I415) QWERTY slider from Verizon. However, the smartphone in question has now been leaked on the web, and a QWERTY keyboard is nowhere to be seen. 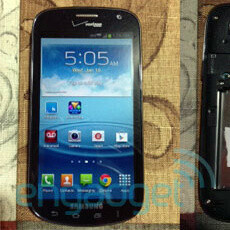 Instead, the device reminds us a lot of a Samsung Galaxy S III with redesigned Android buttons. 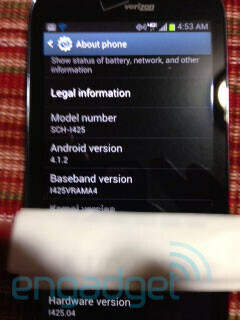 The tipster who provided the images didn't reveal any specifications for the Samsung SCH-I425, although it is being shown that Android 4.1.2 comes installed on it. According to the smartphone's benchmark results, there's a dual-core Snapdragon S4 chip handling all computations and the screen has a resolution of 1280 by 720 pixels. There's also support for Verizon's 4G LTE wireless network. Further details aren't yet known, but an official announcement of the Samsung "Godiva" might not be far off. So its the Galaxy Stellar 2!!!!!! oh boy! Actually by what I can see out of the pics it's not a gs3 body, but rather a Stratosphere with updated internals, jellybean, and no keyboard. But I agree it seems pointless to release, unless you like everything about the gs3 but the screen size. Or you like the Stratosphere but wish it didn't have a keyboard. Like I said in the first article on this phone, they putting out to many throw away phones. They need to focus on a few models and make sure that those don't get EOL for at least 2 years so they will last the contract. this has more in common with the Galaxy Stellar tbh. This will be one of those phones that people complain about when it never gets a software update. i don't see why considering it has the exact same specs as the SIII and it's running UX. also doesn't it look like on the back cover that it supports wireless charging? a pretty nice feature for anything that Samsung or Verizon is going to let sit in the SIII's shadow. money is definitely on it being Droid Branded so Verizon can sprinkle it with their marketing magic.